The President of India, Shri Pranab Mukherjee received the first copy of the book ‘Uniki’ in Hyderabad today (July 3, 2015). The book has been written by Shri Ch Vidyasagar Rao, Governor of Maharashtra. 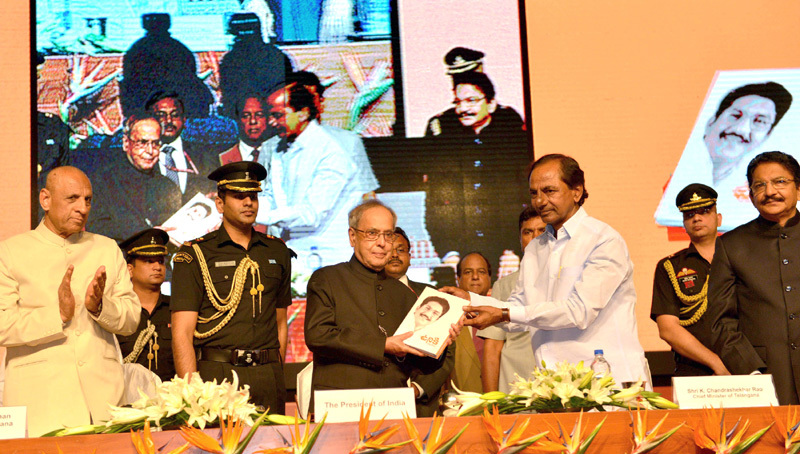 The President received the book from Shri K Chandrashekar Rao, Chief Minister of Telangana who formally released it. 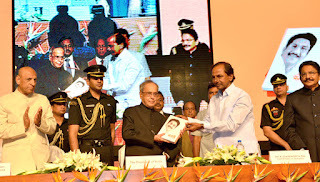 Speaking on the occasion, the President appealed to the people of both the states of Andhra Pradesh and Telangana to work in close harmony, so as to ensure sustainable development and betterment of the people of the country and help it earn its rightful place in the comity of nations. He said that we all belong to India. He stated that we need to remember that we can choose our friends but cannot choose our neighbours. Therefore, it is us for decide whether we should live in harmony and peace with our neighbours. The President said that he was happy to receive the first copy of the book ‘Uniki’ authored by Shri Vidyasagar Rao. He congratulated Shri Rao for bringing out this useful compilation of writings and reflections on his life and experiences. He stated that the title, ‘Uniki’, which means Existence, evokes a philosophical view of the issues and events that have been written about in this book. The President said he has known Shri Rao since the early days of his illustrious parliamentary career and when he served as Minister of State for Home, Industries and Commerce in the Cabinet of Shri Atal Bihari Vajpayee. He stated that earlier Shri Rao had been Floor Leader of his party in the Andhra Pradesh Legislative Assembly for 15 years. He was successful in piloting a private member’s bill in the Andhra Pradesh Legislative Assembly that sought stringent punishment for people practicing bigamy. The total sown area as on 3rd July, as per reports received from States, stands at 306.06 lakh hectare as compared to lakh hectare at this time last year. It is reported that rice has been sown/transplanted in 54.03 lakh ha, pulses in 22.61 lakh ha, coarse cereals in 43.72 lakh hectare, oilseeds in 74.17 lakh ha and cotton in 60.16 lakh ha. Further Boost to Defence Manufacturing, DIPP Clears Defence Licenses Worth 613 Crs. The Department of Industrial Policy & Promotion(DIPP) has been in the vanguard for undertaking major reforms to promote Defence Manufacturing under Make in India Initiative. Continuing with the momentum created, it has so far issued 73 Industrial Licenses in Defence sector during last one year (since June 2014), against 50 License granted during 2011 to May 2014. These include 16 proposals with proposed investment of Rs. 613 crores, cleared in recent Licensing Committee meeting chaired by Secretary, DIPP, held on 10.06.2015. The proposals cleared in last Licensing Committee meeting included applications from major players like Pipavav, Tatas, Samtel Thales, Solar Industries, Titagarh, Wagons, Premier Explosives etc. Many of these proposals were pending in Government for last several years. The approved Licenses are for manufacture of various kinds of Arms and Ammunition such as Helicopters, Aircrafts, Radars, Bullet Proof Jackets, Bullet Proof Helmets, Ammunition Fired from Artillery, Tanks, Helicopters and Aircrafts, Rockets and Missiles, Filled Fuzes for Artillery Shells, Mortar Bombs, Missiles, Grenades, Vessels of War, Radar, Electronic War-fare Systems, Night Vision Devices, Guns, Howitzers, Mortars, Protected Tactical Vehicles, Guns, Howitzers, Mortars, Protected Tactical Vehicles, Armoured Vehicles, Armoured Personnel Carriers, Military fuses, UAVs etc. Recently, Government had increased the initial validity period of Industrial License for Defence Sector to seven years from earlier three years, further extendable upto three years, in view of the long gestation period of defence contracts to mature. In addition to this, the Government has taken a series of measures to improve the Ease of Doing Business in India. The Government now expects that these measures will give a boost to the private participation in the vast opportunities available for defence manufacturing in India. With the launching of “Digital India Week” by Hon’ble Prime Minister of India today on 01st July 2015, Department of Posts, J&K Circle is also celebrating the week in Srinagar Jammu, Udhampur, Ladakh, Baramulla and Rajouri Postal Divisions. In Srinagar the celebration started in Srinagar GPO Complex and will last for the week during which the prowess of Department of Posts will be depicted in terms of leading mail carrier across the state, serving the public in channelizing the small scale investments through financial inclusion, insurance facilitator, potential channel for catering the demands of growing e commerce business and integrating whole India under one establishment ie. India Post. In important Post Offices including Srinagar GPO and Anantnag Head Post Office the Department of Posts hosted Jana Chetna Diwas in which Live streaming/TV broadcast of inaugural function of launching of digital week was shown to the staff. During the upcoming days of the “Digital India Week” the Department of Posts, J&K Circle will be organizing PLI melas, visit of School going children to Computerized Post Offices, linking of existing Saving Bank accounts, Savings certificates and PLI Policies with Aadhar Numbers and Mobile Numbers for availing customers the facilities of digital locker, holding of meeting with potential customers to educate them regarding futuristic preparedness of e commerce and redressal of public grievances. Today on 3rd day of “Digital India Week” J&K Postal Circle organized visit of school students to computerized Post Office which include Srinagar GPO, Anantnag HO, Baramulla HO and many other major Post Offices. About 1200 students from more than 30 schools which include Govt. Schools and some prominent schools visited various computerized Post Offices. The main function was celebrated in Srinagar General Post Office where the students were shown computerized booking of various articles of letter mail, parcel mail, opening of saving bank accounts, commemorative postage stamps issued by Department of Posts, printing of personalized “My Stamp” process of mail, post shop etc. The students were also shown stage by stage the processing of booked articles for further dispatch to their office of destination. Department of Posts is organizing various competitions in which they can participate and win the exciting prizes. Students can participate in the Stamp Design Competition for students which is open for all those people who are upto 18 years of age and is organized at national level. This competition has started from 01.07.2015 and will be open till the end of August 2015, during which participants can send their painting on the title “A Day in the Rains” by speed post to Philately Division office of Director General (Posts), Dak Bhawan Sansad Marg, New Delhi-110001. The students were enthusiastic to see tremendous changes which have taken place in the Postal set up after introduction of computerization and the various new schemes introduced by Department of Posts. During the ongoing “Digital India Week” in J&K Circle, Department of Posts J&K Circle organized PLI Melas and Savings Bank Melas at various major Post Offices in Kashmir region. A good number of customers attended the Melas and were made aware about the various schemes under Postal Life Insurance and Savings Bank. The customers showed good interest in opening of accounts especially the latest launched Savings Bank Scheme “Sukaniya Samridhi Yojna” which is for the benefit of the girl child. Department of Posts is now providing Core Banking Services in Head Post Offices and today large numbers of accounts were opened by the customers under various schemes. The customers appreciated the Department for providing the latest facilities in the Post Offices. During the upcoming days of the “Digital India Week” school going children of prominent schools will be visiting the Computerized Post Offices to see the functioning of Post Offices and facilities provided therein. The Department of Posts will be linking existing Saving Bank accounts, Savings certificates and PLI Policies with Aadhar Numbers and Mobile Number in CBS Post Offices. A wreath laying ceremony to commemorate the death anniversary of Brigadier Mohammad Usman, MVC was organised at Jamia Millia Islamia University Cemetery on 03 Jul 2015. Several Retired and serving officers including Lieutenant General NS Ghei, Commandant, National Defence College and Colonel of the Parachute Regiment attended the function. Late Brigadier Mohammad Usman, also known as the “Saviour of Naushera” , was responsible for the recapture of Jhangar & Naushera (Jammu & Kashmir) during 1947-48 war with Pakistan. The gallant officer attained martyrdom on 03 Jul 1948. Brigadier Mohammad Usman set an example of personal courage, exceptional qualities of leadership and devotion to duty in the highest tradition of the Indian Army and was thus, rightfully honoured with the Mahavir Chakra. The Union Home Secretary Shri LC Goyal reviewed the status of 15 critical bridges in the Left Wing Extremism (LWE) affected States in a meeting held here today with the Chief Secretaries of the State Governments and the Senior Officers of the concerned Union Ministries. During the meeting, pending works under the Road Requirement Plan Phase-I (RRP-1) & the issues relating to the proposed RRP-2 were also discussed. Shri Goyal asked them to take all possible steps to speed up the works within specific timelines. The Government of India is committed to address the LWE problem by focusing on four-pronged strategy involving security related measures, developmental efforts, ensuring of rights and entitlements of forest dwellers and management of public perception. The Home Secretary asked the representatives to speed up the completion of works while removing the bottlenecks as these 15 bridges are very important from the security as well as development angles and any delay is a cause of concern for the Ministry of Home Affairs. Out of the above 15 bridges, one is in Andhra Pradesh, two in Chhattisgarh, four in Jharkhand, two in Maharashtra, five in Odisha and one in UP. The Government has asked the Cadre Authorities in various Ministries/Departments to submit Action Taken Report latest by July 10, 2015 on framing Rotational Transfer Policy and putting up in public domain, identification of sensitive posts and rotation of Officers from sensitive posts as per provisions. The Rotational Transfer Policy aims to harmonise objectives of institutional memory, avoid development of vested interests and provide variety of exposure to employees thereby ensuring overall growth of an officer. While the Transfer Policy prescribes minimum and maximum tenure for each post, any exception should be with the approval of the Committee constituted for this purpose which shall record the reasons in writing.